Fes el Bali is the oldest walled part in the city of Fez, Morocco. With a total population of 156,000, the area is believed to be the biggest car-free urban neighborhood in the world due its narrow streets that are only two feet wide in some sections. Serra de Santa Bárbara is an inactive volcanic peak on the island of Terceira in the Azores, Portugal. At 3,350 feet (1,021 m), it is the highest point on the island. Just below the peak is the Santa Bárbara Caldera, which is roughly 0.6 miles (1 km) in diameter and has two smaller peaks in its center. Princess Juliana International Airport is the main airport on the Caribbean island of Saint Martin. The airport is well-known for the approach to Runway 10, seen at the bottom of this Overview. Here arriving aircraft must have a 3° glide slope, flying at a shockingly low altitude over people relaxing on Maho Beach, to land safely. A personal water craft speeds away from a pier on the Inglis River in North West Tasmania, Australia. The Inglis flows for roughly 38 miles (61 km) before emptying into the Bass Strait, the body of water that separates Tasmania from the Australian mainland. Copper residue stains the walls of the Bingham Creek Reservoir in Salt Lake County, Utah. The reservoir is owned by the Kennecott Utah Copper Corporation and is used to store wastewater from the nearby Bingham Canyon Mine, one of the largest open-pit copper mines in the world. Panteón Civil San Nicolás Tolentino is a cemetery covering about 230 acres (93 hectares) in Mexico City, Mexico. Its namesake, Nicholas of Tolentino, was an Italian saint and mystic and is known as the Patron of Holy Souls. 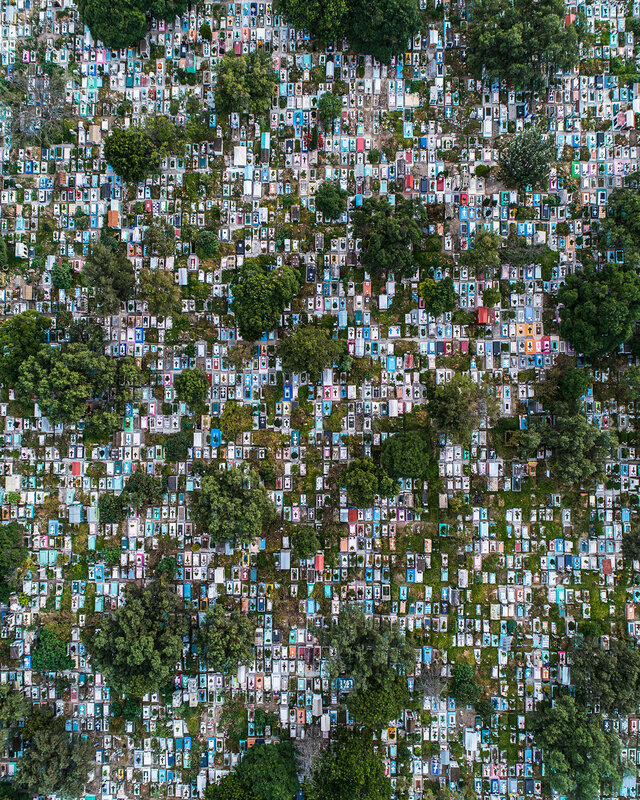 The colorful gravestones seen here are typical of cemeteries throughout Mexico, as they are meant to be an expression of culture and often reflect the deceased’s hobbies, lifestyle or profession. Check out this amazing Overview of Chicago, Illinois, and Lake Michigan during last week's polar vortex. Captured Thursday by the European Space Agency's Sentinel-2 satellite, it shows the entire city covered in snow with massive chunks of lake ice floating offshore. Chicago finished off the month of January with 13 consecutive days of snow and some of its coldest temperatures in more than three decades. Brightly colored shipping containers are stacked next to a scrap metal storage yard at the Port of Tacoma, Washington. This facility takes in a variety of scrap metals from commercial, industrial and public sources throughout the Pacific Northwest and then sorts, packages and ships it to recycling plants, mills and foundries around the world. In 2015, the Port of Tacoma handled $52.1 billion in international trade, importing and exporting 19 million short tons of cargo. 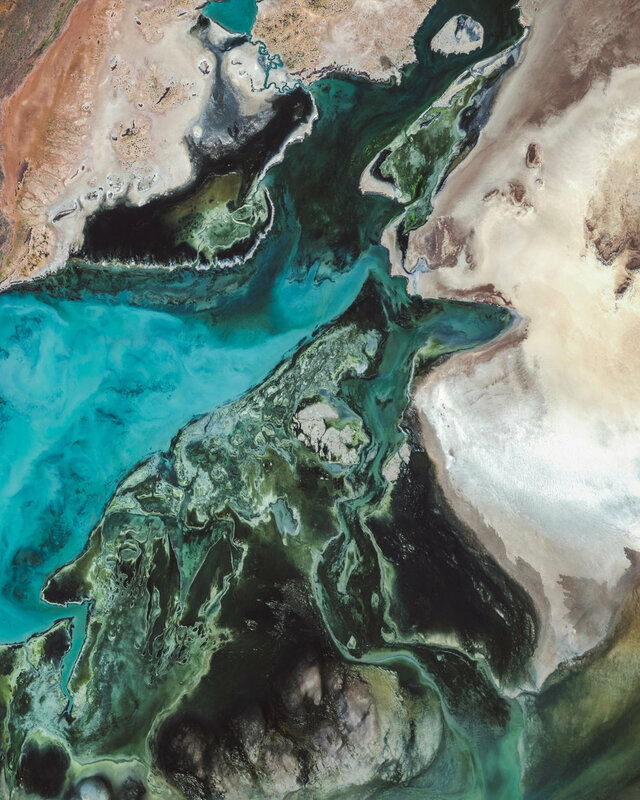 Lake Macleod is the westernmost lake in Australia, located just north of the small coastal city of Carnarvon. Covering 500 square miles (1,500 sq. km), the lake is quite shallow with a maximum depth of about 5 feet (1.5 m). Large parts of the lake have been identified as Important Bird Areas, supporting fairy terns, red-necked stints, curlew sandpipers, banded stilts and other species. A variety of retired aircraft sit on display at Chino Airport in San Bernardino County, California. The airport played an important role during World War II when it housed the Cal-Aero Academy, a flight training school for Army Air Cadets. After the war, hundreds of combat aircraft were brought to Chino for disposal; but many have been restored by two on-site aircraft museums — the Planes of Fame and the Yanks Air Museum. Waves roll into the shores of Moloka'i, Hawaii. At 260 square miles (673 sq. km), the volcanic island is the fifth largest of the Hawaiian Islands and contains some of the highest sea cliffs in the world. Moloka'i is known for its cattle ranches, pineapple farms, and is also a popular tourist destination. Want a copy of this Overview to hang in your home? It’s available for purchase in our Printshop! 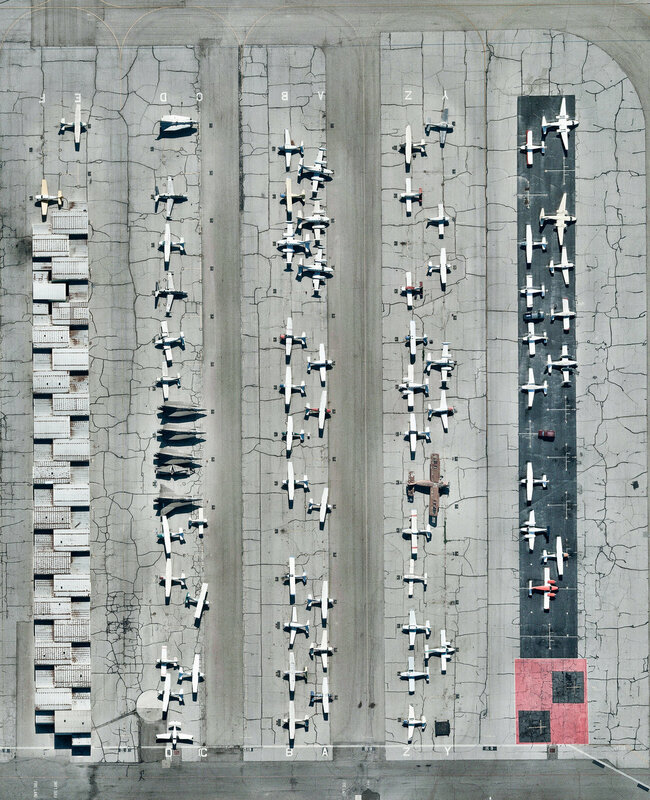 Head over to dailyoverview.com/printshop to find it and other prints for sale. 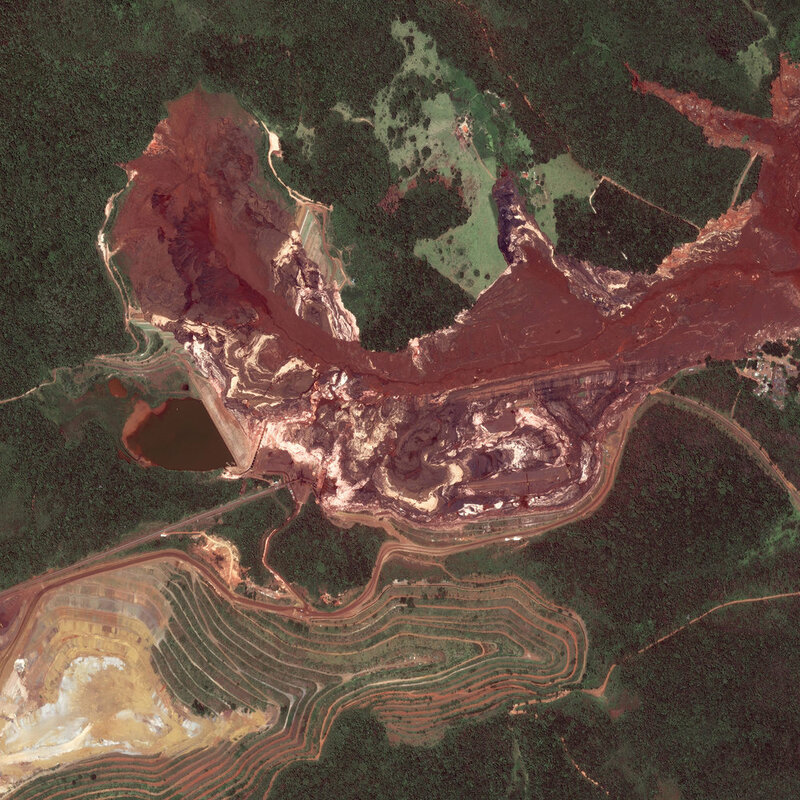 Last Friday, a tailings dam collapsed at an iron ore mine in Brumadinho, Brazil, spilling out more than 3 billion gallons (12 billion liters) of red mud and debris. 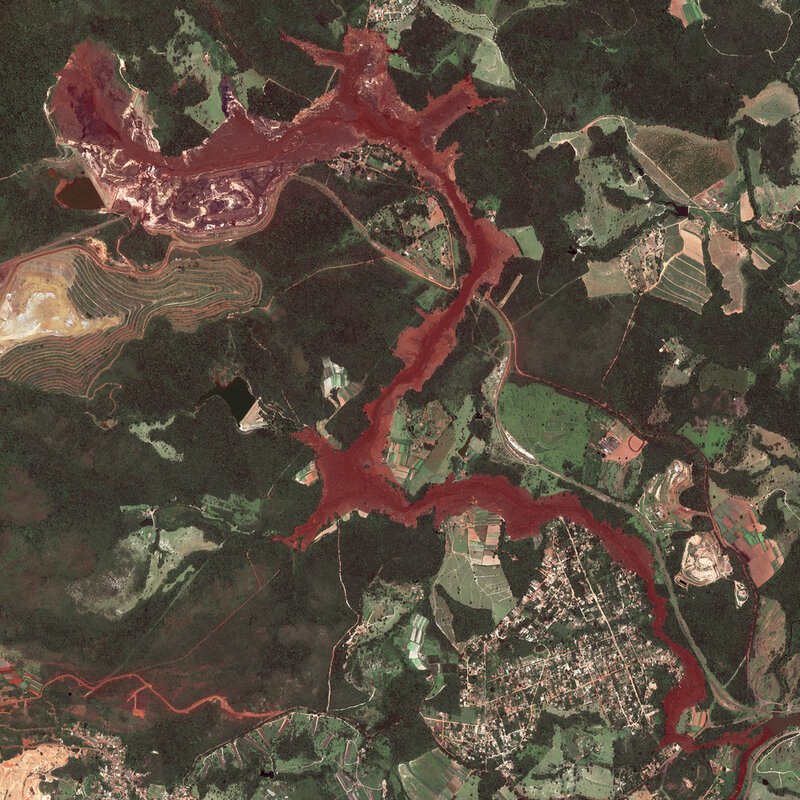 These Overviews show the areas around the dam before and after its collapse. Homes, cars, buses and other structures were engulfed by the sludgy spill, and the region's entire ecosystem is expected to be impacted by the contaminants in the tailings — which include waste rock and other residue left over after ore extraction. As of today, media sources are reporting at least 99 people have died and more than 270 are missing. Sunglow Pier extends into the Atlantic Ocean from the shore of Daytona Beach, Florida. The pier is a popular fishing spot for visitors, with an on-site rod, reel and bait shop and a small restaurant. Daytona Beach has more than 23 miles (37 km) of white sand beaches. 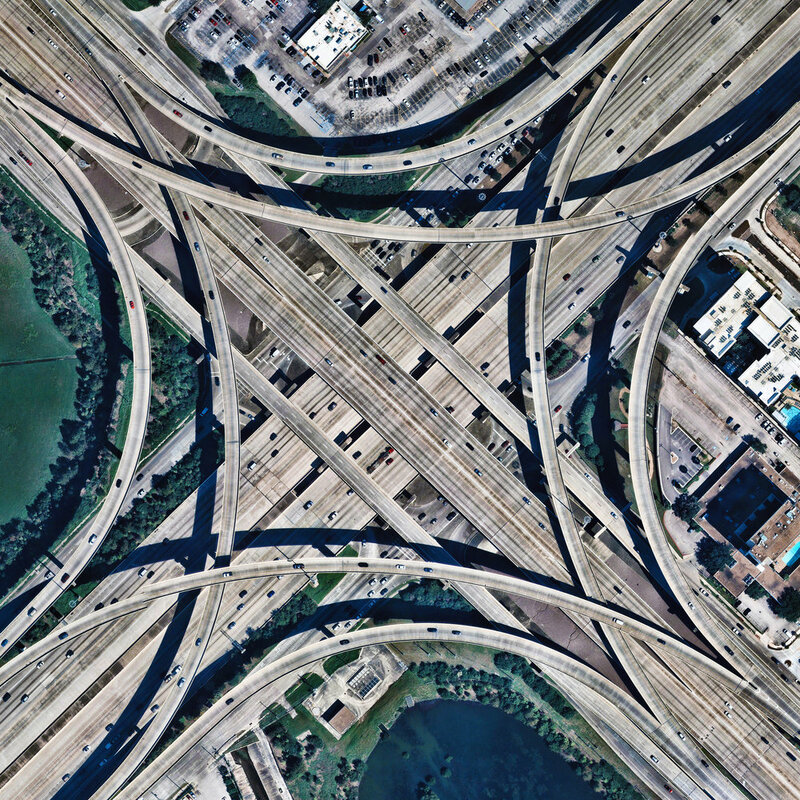 A stack interchange forms at the intersection of Beltway 8 and Interstate 10 in Memorial City, Texas. Officially known as the “Memorial Management District,” Memorial City is a commercial district of Houston. Stack interchanges eliminate the problems of vehicle weaving, but have a large footprint and are widely considered to be an eyesore by those who live near them. Laguna Salada de Torrevieja is a 35-acre (14-hectare) hypersaline lake in Torrevieja, Spain. It is connected to the Mediterranean Sea by a small canal and has been used to harvest salt from the ocean since the 13th century. The lake's vibrant pink color is caused by archaeas and dunaliellas, two types of microorganisms that live in the lake and synthesize elements of its salty water to survive. Check out the amazing shades of red in this saltwater evaporation lagoon near St. Kilda, South Australia. This small suburb of Adelaide is surrounded by such ponds, which are filled in the spring and harvested in autumn. Salt taken from the ponds used to make soda ash, a key ingredient in the production of glass, paper, soaps and detergents. Lido Isle is a man-made island located in the harbor of Newport Beach, California. There are no commercial facilities on the island other than a small seasonal snack bar, and its only link to the surrounding city is a small bridge. It is solely residential, with approximately 1,800 inhabitants.